An infinity pool with a panorama of the Hilutungan Channel and Magellan Bay, a spa and gym with top-of-the-line equipment, and Japanese design features like a rock garden, Onsen room, and a Niwa are just among the amenities that await unit owners of 8 Newtown Boulevard at the Megaworld township of Mactan Newtown in Lapu-Lapu City. Megaworld Cebu Properties, Inc. president Noli D. Hernandez, who led a tour of the facilities for the residential towers, said these are scheduled for completion by the first quarter of 2016. Many amenities for 8 Newtown Boulevard are located at the expanded open space on the fifth level which will connect all four 18 stories-high towers. The pool, called the Horizon Edge, borders the front central portion of this level for 61 meters. MAJESTIC VISTA. The Horizon Edge Pool, which is still undergoing finishing touches, offers a breathtaking view of the Hilutungan Channel. ROOM WITH A VIEW. The vista from a unit that has been turned over to its owner. FROM THE TOP. The view of the Horizon Edge Pool from the top of the scale model of 8 Newtown Boulevard. 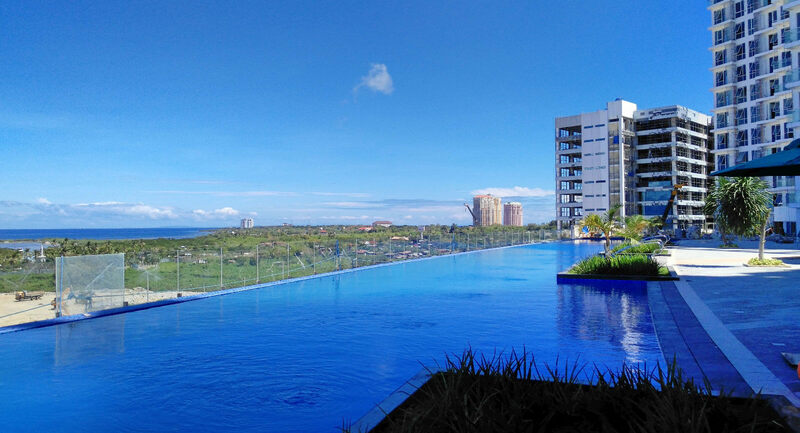 Jojo Hipolito, Megaworld assistant vice president for Cebu sales, said the infinity pool is nine meters wide and measures five feet at its deepest. A few steps down the pool deck is the Japanese rock garden and still at the fifth level but located indoors is the gym and spa. Hernandez said Mactan Newtown’s first residential project 8 Newtown Boulevard has Japanese-inspired components, including an Onsen (hot spring bath) room and a Niwa or a traditional landscaped garden. The Niwa will dominate the other side of the fifth level’s expanded open space and feature a man-made lake with a foot bridge. There will be rooms where residents can experience Japanese hobbies like Ikebana (flower arrangement) and Origami (paper folding). LOBBY. The lobby of one of the 8 Newtown Boulevard towers. LOBBY CENTERPIECE. This interesting light fixture dominates the lobby and was manufactured here in Cebu. Harold Geronimo, Megaworld head of public relations and communications, said the 8 Newtown Boulevard towers have been positioned to maximize the sea vistas of Mactan. “Megaworld has been known for developing a lot of world-class communities in Manila and elsewhere, but in Cebu, specifically in Mactan Newtown, we offer not only the township we are known for but the surrounding scenery as well,” Hernandez meanwhile said. During the tour, he pointed out the huge and plush lobby for the first and second tower clusters and showed a combined unit at the 17th floor. The second to the fourth floors will have business offices while residential units will make up the fifth to 18th levels of the 8 Newtown Boulevard towers. VIDEOCOM. Jojo Hipolito (right), Megaworld assistant vice president for Cebu sales, shows to journalists and bloggers the video intercom feature in units at the 8 Newtown Boulevard. WORLD-CLASS COMMUNITIES. Megaworld Cebu Properties, Inc. president Noli D. Hernandez (left) says Megaworld is known for developing world-class communities. At right is Harold Geronimo, Megaworld head of public relations and communications.